Cactus has always managed to pump out games that addict me at an alarming rate and continues to do so with surprising consistency. Practically every time I log on, there's a new hectic experience for me to download and literally waste hours playing. My newest such addiction is SeizureDome, and I think I might just play this game instead of eating shrooms from now on. The game begins allowing you to type in your name and choose your settings based on your graphics card. After that, you see a bouncing sumo wrestler in the corner with blur effects everywhere. Certainly peaked my curiosity. The gameplay concept is pretty simple. Like in sumo wrestling, you want to stay inside an area as your enemies try to push you out of bounds. Only this time, you are swarmed by a ridiculous amount of freakish enemies at a frantic pace. Oh yeah, and you have a gun. 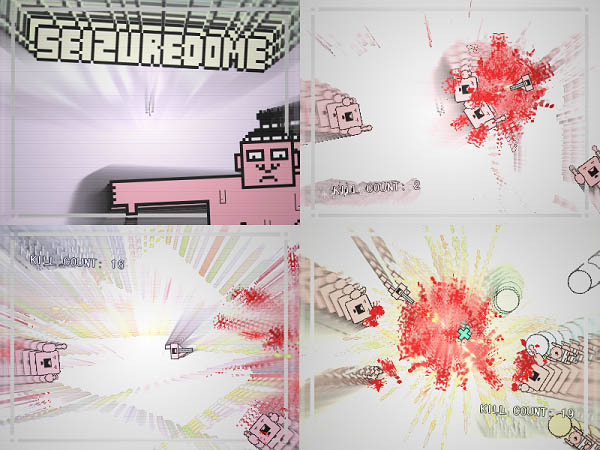 SeizureDome features several kinds of enemies as well as a variety of weapon power-ups to keep the game interesting. My personal favorites are the rocket launcher and laser. The graphics themselves are quite simple, like in most of Cactus' efforts, but the effects surrounding every action are what really make this game. The blur effects, blood splatters, the ever moving HUD; quite literally everything that happens is recorded onto the background. Overall, SD is a pretty sweet sight to behold. I don't quite understand how, but what would honestly be one of the most annoying songs ever on its own manages to add a touch of magic to the game. Seriously, I would hate this song and probably smash my speakers if I had to listen to it outside of SeizureDome as much as I've been hearing it the past few days. However, inside of the game, it creates a fun sense of atmosphere that ties in well with all the other elements, and I actually quite enjoy it. Recommendations: The 6 people who like SeizureDome also like the following games. Its way too easy and slow. I got up to 200 and got bored. The music was pretty cool though. I think the score was fine. Its replay value isn't the best. It defineatly is a low score. I think the game deserves at least an 8. It scared me. It had some of the best effects ever, though, and the gameplay was a lot of fun. very well put together. reminds me of a lot of the wii games that have been coming out. strange music, anime-type animation, and focuses on simple gameplay concepts. I can't quite to a 10 or a 9 because of the lack of variety and moderately low replay value, but there's still a lot to recommend here. A 7.3 definitely isn't low.